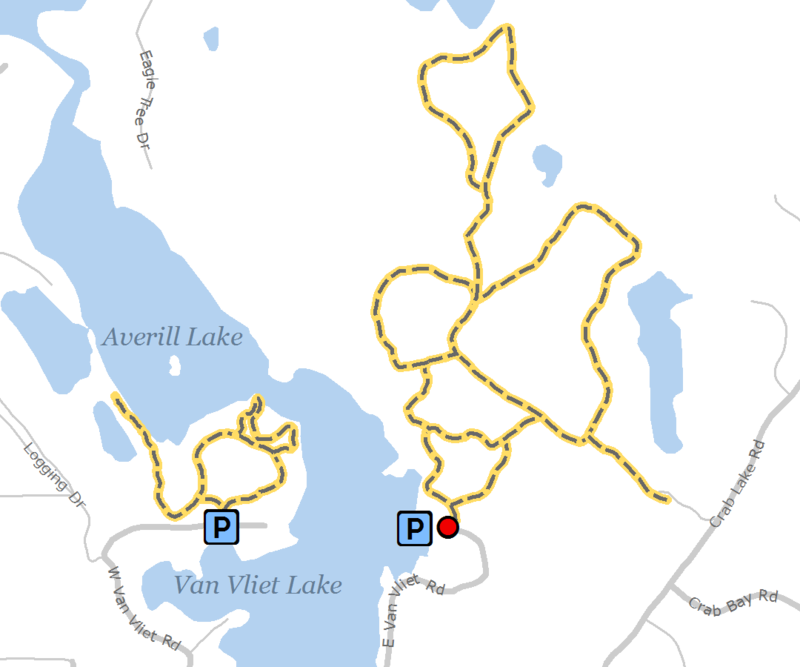 Location: For east-side trailhead: From County Hwy B and Crab Lake Road in Presque Isle, take Crab Lake Road south 3.7 miles to East Van Vliet Road and continue west on East Van Vliet Road for 0.9 miles. For west-side trailhead: From County Hwy B and Crab Lake Road in Presque Isle, take Crab Lake Road south 5.1 miles to West Van Vliet Road. Travel west on West Van Vliet Road about 0.6 miles stay right and then make a quick left for about 1.1 miles, continue right on West Van Vliet Road for 0.3 miles to the parking area. This recently developed trail system gives visitors the opportunity to explore and experience 400 acres and 1 ½ miles of undeveloped shoreline in an old growth hardwood-hemlock forest.